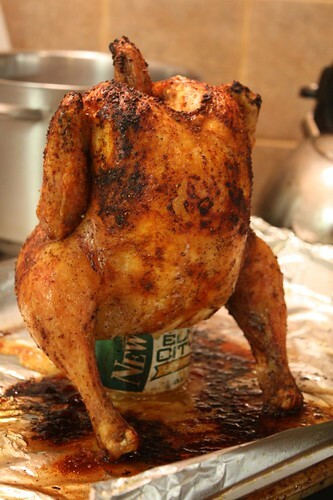 I've never made beer can chicken. That is until tonight. 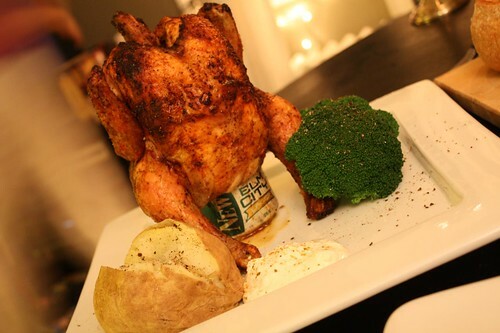 Beer can chicken is something I've always heard about and kind of wondered what the big deal was. 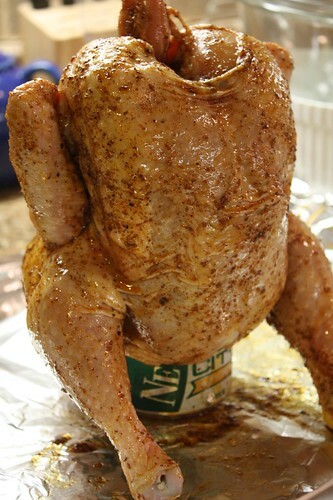 So you stick a beer can inside a chicken and cook it. So what? Besides I never really knew how you did it? Did you leave the can full of beer? That didn't sound right, surely it would explode in the oven. Did you empty it? Then if you did that what was the point, couldn't it just as easily be regular roast chicken? I learned that you were supposed to leave the can of beer half full. That, paired with the fact that I just picked up some canned beer that I wanted to try, sounded rather enticing. So I stood up a chicken on a half-emptied can of beer and seasoned it generously with cumin seeds, celery seeds, smoked paprika, chili powder, brown sugar, salt, pepper, and olive oil. I ground the spices together with a mortar and pestle before adding it to some olive oil generously rubbing the chicken inside and out. The result was, as anticipated, a roast chicken. 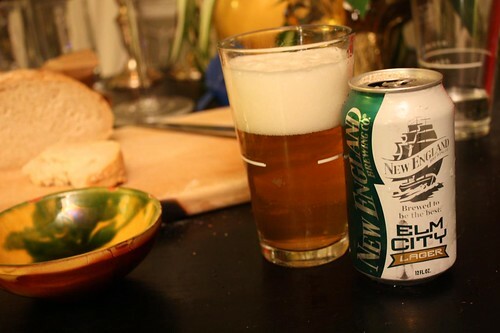 The beer that I used was Elm City Lager from New England Brewing Co. in Woodbridge, Connecticut. So what better to enjoy with the chicken? I guess it's more traditional to use Budweiser or something but I just couldn't allow that to happen. Overall this was pretty tasty. I can now see why it is popular. Cooking vertically shouldn't really add much but it does produce a slightly different chicken. The beer in the can helps to steam the inside of the chicken and the breast meat in particular was extremely moist. It's more traditional to do this inside a barbecue but with sheets of rain and ice plummeting from the sky I just couldn't get myself psyched to use the grill this evening. While it was good with a baked potato and some steamed broccoli I think I will recreate this one in the warmer months (or at least the drier days of the colder months) and serve it with some nice fresh tomatoes and grilled corn. This used up absolutely nothing from the pantry, freezer, or fridge. Everything was purchased specifically for this meal including the beer. That's okay though, it's Jen's last night in town before shipping out to Salt Lake City. Generally she likes nothing more than a roast chicken. I will need to work extra hard in her absence to move through all of these leftovers and get back to tackling our swelling pantry. Les Organes de Canard sont Bruts!